Mute saloon keeper Donnell knows all about prejudice; he’s had to battle it all of his life. He also knows how self-righteous and judgmental the people of the old west town of Nazareth can be, so he isn’t surprised when he sees them spurn requests for work from a man who walks into town looking to be all but on his death bed. Donnell takes the man in and nurses him back to health, falling in love along the way. But is Donnell destined to have his heart broken? Dona Nobis Pacem by Willa Okati takes place during the nineteenth century in the American West. The story setting is the town of Nazareth during the decline of the gold rush boom and the beginnings of townships with the arrival of doctors, lawyers, bankers and their families to the settlements. The story is told from the perspective of Donnell, a mute saloon owner born of a whore who died shortly after giving birth to him. Bettina, a fiery wisp of an Irishwoman who raised Donnell and taught him how to sign, now helps him run the saloon. She, along with Levi the saloon’s burly bartender and Donnell’s best friend, are the only family that Donnell has ever known. Given his past and his physical challenges, Donnell is no stranger to the scorn of the “proper” towns folk, or to harassment from Nazareth’s self-anointed messenger of God, Preacher Michael Mallone, a manipulative and dangerous man. Donnell has a great mistrust of the “civilized” townspeople and contempt for Mallone and religion in general. He thanks God for the “sinners” who frequent his establishment “Treighton’s” and entertains them with his piano playing. His music is one of his greatest loves and it is his voice. Donnell is also a very courageous, proud and compassionate man who is not afraid to take a stand and help a soul in need. Donnell does just that when Nathan, a tattered and torn man who is on death’s doorstep, stumbles into town in search of work and is ridiculed and shunned by the God fearing people of the town. He takes Nathan in and nurses him back to health and in the process falls in love with him. Nathan has experienced great sorrow in his life. He was orphaned at a young age and taken in by a religious fanatic who abused him and literally banished him to face almost certain death. Nathan is understandably dealing with his own demons when Donnell rescues him. Dona Nobis Pacem is an extremely well written story with well-developed primary and secondary characters and an excellent plot. It is also a richly layered story. While the focus of the story is the coming together of Donnell and Nathan, it also deals with such weighty issues as intolerance and prejudice. While Okati sets this story in an American mining town circa 1800s, the themes of this story are quite timely in the twenty-first century. Okati does a tremendous job in the writing of all the characters, however, it is the character of Donnell that I found to be one of the main strengths of this story, in particular his rich point of view. What also captured my attention throughout was the authentic manner in which the characters speak, their phrasing and idiomatic expressions are true to the time and place of the story. The character of Donnell in particular stands out in this respect. Another element that immensely appealed to me was that Dona Nobis Pacem deals with timely themes and issues, such as religious fanaticism, intolerance, hypocrisy and prejudice versus the acceptance and celebration of diversity, not only in terms of sexuality, but also in respect of class and physical differences. In this sense, this story could have easily been written about the here and now. Okati explores these and other themes through Donnell and Nathan’s coming together without interrupting the rhythm and flow of the overall story. The title of this story, Dona Nobis Pacem, is the Latin phrase for “grant us peace” and is found in sections of the Roman Catholic mass. In the end, Donnell and Nathan are both granted peace, which they find in each other. I thoroughly enjoyed reading this story. It is tender and compassionate and it captured both my imagination and my heart. 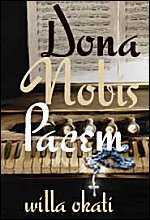 Dona Nobis Pacem by Willa Okati is available at Torquere Press. NOTE: This review was originally published online by Rainbow Reviews. This entry was posted in Fiction, Historical, Indie Reviews, LGBTQ, Rainbow Reviews, Romance, Western/Cowboy and tagged Torquere Press, Willa Okati by Indie Reviews. Bookmark the permalink.